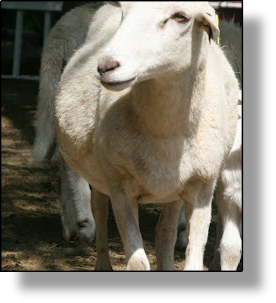 The St. Croix is a breed of domestic sheep native to the U.S. Virgin Islands and named for the island of Saint Croix. They are often also called Virgin Island White because those that were imported into North America were selected for white coloration. On the Island of St. Croix, they come in shades of brown, white and black. The breed is believed to be descended from African sheep that were brought to the Caribbean on slave ships, and is a breed of hair sheep which does not grow wool. The St Croix is a hardy tropical breed known for its parasite resistance, and is raised primarily for meat production. Breeders have crossbred the St Croix with other breeds to impart these important traits into their bloodlines. The St Croix breed is the foundation breed for Katahdin and Royal White breeds. Most St. Croix are white with others being solid tan, brown, black or white with brown or black spots. Ews and rams are polled, and rams have a large throat ruff. Mature ewes weigh 68 kg (150 lbs) and rams weigh 90 kg (200 lbs). Birth weights average 2.7 kg (6 lbs) to 3.1 kg (7 lbs). They are generally more resistant to internal parasites than conventional sheep. The ewes can breed back one month after lambing and can produce two lamb crops per year. Twins are common, however, some singles, often triplets and occasionally quadruplets are produced.